ALAS, THE KIDS aren’t particularly fond of vegetables. 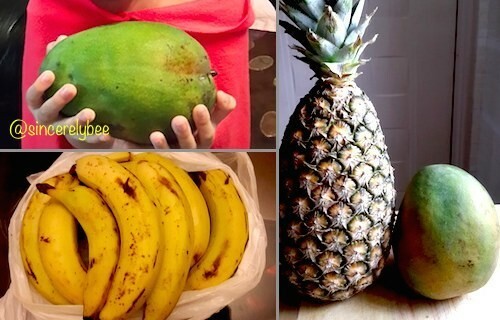 Thankfully they enjoy the tropical fruits here, so I am assured they still get their nutrients including vitamin C, minerals, potassium, fiber and folic acid, among others. Tropical fruits galore including mangoes, bananas and pineapples. 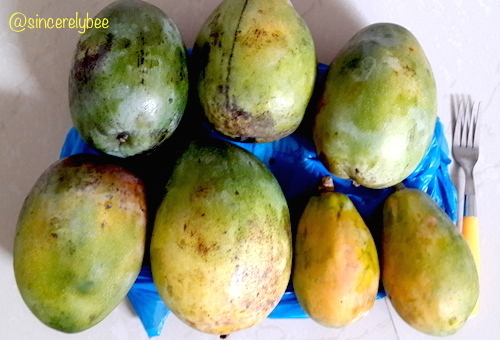 We particularly enjoy the sweet and juicy mangoes, so we always end up getting more mangoes from the fruit stall. Notice the two tiny papayas next to the mangoes. When we are out of fresh fruits, these come to the rescue, though fresh is still the best. We’ve since identified mango juice as our favourite too. This entry was posted in African Adventures and tagged Accra, Ghana, Kids. Bookmark the permalink.